The Getty Villa in Malibu, California has a magnificent collection of Classical antiquities that is equalled by the magnificence of the villa itself. Inspired by the Villa of the Papyri which was buried by the same eruption of Mt. 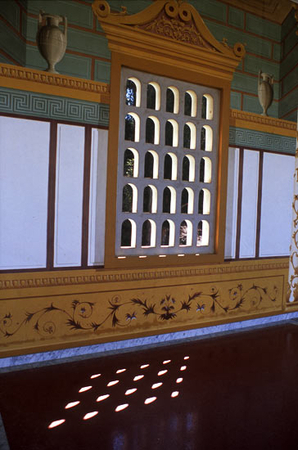 Vesuvius that destroyed, Pompeii, it boasts wonderful colonnades painted with Trompe l’oeil (literally “to fool the eye” in French) murals that surround the splendid gardens. In this image the patterned window treatment casts a dancing pattern on the floor that plays with the eye in an equally delightful way as do the wall treatments.